Christians are often referred to as Pilgrims. That is because the Christian life can be viewed as a journey. Christians believe that when we are done with this world we go to be with God, in a place which is regarded as our spiritual home. Upon that journey we find times when we are full of hope and excitement, and other times when life seems hard and our faith is tested. In the passage from Mark today the disciples are given a glimpse of the majesty of God, it will make them feel great - but it has a much deeper purpose - it will serve to sustain them when times are hard. The Christian is therefore prepared in advance that the road may become rough and steep. It is at such times that we must remain even more firmly fixed on Jesus our Saviour. 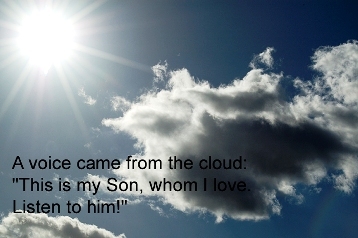 And a voice came from the cloud: "This is my Son, whom I love. Listen to him!" Transfiguration Sunday marks the end of the season of Epiphany. There is a lot of talk about light during Epiphany, beginning with the shining star that led the Wise Men to Jesus. Epiphany literally means ‘to shine on’ or ‘give light to’ and today’s gospel reading about the Transfiguration is all about light shining, from people’s faces, because they have encountered the mystery and presence of God. But how confusing for the disciples. Peter, James and John have been with Christ up the mountain. There can be no confusion for them as to who Christ is, He truly is the Messiah, the Son of God. Even though Peter has already made his declaration that Jesus I the Christ the voice from the cloud leaves them in no doubt as they are then instructed to listen to Christ. After such an experience they would certainly do anything Christ asks of them. But strangely, the first thing Christ says to them is that they should tell no one about what had happened and what they had seen until the one they had just seen transfigured in glory has died and risen from the dead. How could being the Messiah, the Son of God involve suffering as well as glory, pain as well as light and life? Jesus had already begun to explain what would happen to Him but it’s easy to imagine the disciples forgetting this in the heat, light and glory of the moment. Mark records that the disciples obeyed Christ’s command faithfully, but then did talk among themselves as to what this could possibly mean! There are times when we too catch glimpses of God’s glory, and even reflect its radiance it in our faces. There are times too when we are confused and don’t understand what is happening in the heat of the moment. Those are the times when we, like the disciples, have to step out in faith, sure in the certain hope that we will only fully understand God’s plan and our part in it when we meet with the transfigured and resurrected Christ resplendent in all His light and Glory. Today’s gospel reading follows the declaration by the disciples that Jesus is the Messiah. So their decision about Jesus is not prompted by what they see on the mountain. It’s more like what they see and hear on the mountain is a confirmation of what they have already come to believe, that Jesus is indeed the Messiah. As Jane Williams writes,”’ This is my Son, my Beloved’ – you have made the right choice”. The thin curtain that separates the spiritual and physical dimensions of the cosmos is pulled back and the disciples see revealed the glory of the Father and His heavenly Kingdom about to break through on earth. Jesus is the fulfilment of the Old Testament law and the prophets and brings to a completion their work. In Jesus, confirmed once again at the transfiguration, a new day is now dawning, a new era has come. Light is breaking though in our world in a new way. Jesus coming was not a trivial event – it would have cosmic and cataclysmic consequences! The memory of the glorious encounter would last with Peter, James and John for the rest of their lives and into eternity. Whatever they would encounter as they followed Jesus, the joys, trials and tribulations of life as a disciple of Jesus that particular experience and memory would remain with them. They would recall it at night, they would think of it as Jesus spoke to them and taught them of His Father’s love for them and the world. They would hold it before them as they went out into the community in which they lived, to share what it meant to have had an encounter with the Son of God and the transformation that brought in their own lives. If they’d lived in an era of smartphones they would certainly have taken a few ‘selfies’ to capture the moment and to help them remember it for the rest of their lives! Given that Peter, James and John witnessed the bright light of the glory of God its perhaps not surprising that it is these same disciples who are with Jesus in His hour of deepest agony and darkness in the Garden of Gethsemane. In the dark, they would remember the light. In the hour of Jesus’ deepest affirmation and challenge, they would remember the mountain top experience. And yet, not all the disciples experienced the transfiguration. They, like may others to follow them, would need to live off the experience of the few who had witnessed firsthand the intervention of God and His voice speaking in His creation. But mystical experiences are not just the privilege of a few. Each of us in our own way can experience similar mystical experiences at different times of our lives. They can be times when we are reassured of God’s personal relationship and love for us as individuals, they can assure us of God’s purpose in our lives, or that can just be a mystical experience of a power other than ourselves in our lives for a brief moment. But just because we do not always see and hear the transforming and transfiguring light and voice of God does not mean that they do not exist, for others or for ourselves. Our faith will always be a mixture of our own personal experience and spiritual journey and the reflected experience and stories of others on the same road. We may not always hear and experience God in the same way as others but we should not deny the reality of that experience just because it is not ours. God, through His Son Jesus, speaks to each one of us differently, meets with us in different ways; wants us to encounter Him not only in our mountain top experiences but in our valleys of despair. And as He does, as we acknowledge the voice that says, ‘This is my beloved Son, listen to Him’, as we listen to Him and let the light of the transfiguration into our lives, so Christ is able to transfigure and transform our lives. God of dawning light, hear our prayers today and give us the strength to put aside all cares and to chose to follow you in your kingdom; through Jesus Christ our Lord. Amen. for your presence and action in the world. and when vengeance gives way to forgiveness. For this we never cease to thank and praise you. The recent film of 'The Lion the witch and the wardrobe.' by C.S. Lewis is a wonderful story of three children and their adventure in the magical land of Narnia. It is a children's book but also very grown up. It causes us to question whether there is another world. Many people are oblivious to a spiritual world, they are mindful of and governed only by the ordinary and the mundane. That there is a spiritual realm. That when we die we go to meet with God and exist in his presence. Interestingly of course Moses had not entered the promised land, yet now here he was clearly alive in God's promised land. For those considering what happens when we die this may be an interesting piece of scripture to remember. In this place clearly Moses and Elijah are presented as alive in God. Jesus had spoken to his disciples of death and suffering and they were afraid. Then the disciples saw Moses and Elijah! They must have been terrified. Here were two great pillars of the Jewish faith, men who it was believed had been spared death in the normal way. The disciples feared over so much, they were paralysed with fear, we too can be fearful without need. There is much over which we can be afraid, this episode gave the disciples something which would give them strength in the days ahead. This was an opportunity upon which they could reflect. This moment was something which they could not hold onto in time, but they could hold it in their hearts and draw strength from it. It was a God - given encouragement. So it was to be Peter spoke about it later: we had been eyewitnesses of his majesty [2 Peter 1:16-18]. We have all had some experience of the wonder of God. Sometimes it comes to us through the appreciation of nature, sometimes, indeed, on a mountain. But we all have to come back down the mountain and get on with real life, and most of our time is spent at the bottom of the mountain in the valleys of life. The ministry of Jesus could not be conducted from the mountain top, it was instead something carried out on the cross of suffering. But when the disciples were tempted to give up and think that the Christian service to which they were called was a hopeless cause, they were to look back and remember Christ as they knew him in the Transfiguration, clothed in glory. Some of the details of the story are worth mentioning. Mountains were important places. If we think back in the Bible we will remember Moriah, Horeb, and Sinai. These were important mountains upon which God was made known. Moriah was where Isaac was nearly sacrificed, on Sinai Moses received the law and at Horeb Elijah met God. We are told by Mark that the clothes of Jesus became 'stilbein.' This is a word which is used for the bright appearance of gold or shinning polished steel. We are reminded of the shekinah, the divine presence. In Jewish thought the presence of God is often associated with the appearance of cloud. Remember this is where Moses met God. When Solomon dedicated the Temple it was filled with cloud. By including the presence of cloud, Mark was saying something important about the presence of God with Jesus. This was important because Jesus had just been to Caesarea Philippi and determined to go to Jerusalem to die. This was a signal that God was with Jesus in this decision, he was following the path of God. This was confirmed by the presence of Moses the law giver and Elijah who represented the prophets. Everything that had gone before was now finding fulfilment in Jesus. It is important for us to try and understand how significant this would have been for the disciples. They had no doubt been shattered by the decision of Jesus that he would go to die in Jerusalem. Now here was a scene in which they could receive assurance that Jesus had made the right decision. For a moment the cloak which divides our material world from the spiritual realm is drawn back for the disciples and they are able to receive a glimpse of the 'other side.' Many people would want to see the incident as some kind of hallucination, but this is to miss the point. In some ways this story is not unique. Throughout the ages there are times when many Christians have been able to speak of having experienced the reality of God presence is a manner which is extraordinary and convincing. There are occasions when the curtain is pulled back momentarily and that we which hope for, which lies unseen is confirmed in a dramatic way. We should be sceptical of such reports, we should not expect them to come often, nevertheless they are true and we should rejoice that there are those who are able to speak of them and reassure us all in times when the valleys seem so much lower than the mountain tops. "Therefore I am now going to allure her; I will lead her into the desert and speak tenderly to her. There I will give her back her vineyards, and will make the Valley of Achor a door of hope. There she will sing as in the days of her youth, as in the day she came up out of Egypt. "In that day," declares the LORD, "you will call me 'my husband'; you will no longer call me 'my master, I will remove the names of the Baals from her lips; no longer will their names be invoked. In that day I will make a covenant for them with the beasts of the field and the birds of the air and the creatures that move along the ground. Bow and sword and battle I will abolish from the land, so that all may lie down in safety. I will betroth you to me forever; I will betroth you in righteousness and justice, in love and compassion. I will betroth you in faithfulness, and you will acknowledge the LORD. "In that day I will respond," declares the LORD - "I will respond to the skies, and they will respond to the earth; and the earth will respond to the grain, the new wine and oil, and they will respond to Jezreel. I will plant her for myself in the land; I will show my love to the one I called 'Not my loved one. ' I will say to those called 'Not my people, ' 'You are my people'; and they will say, 'You are my God. While Jesus was having dinner at Levi's house, many tax collectors and "sinners" were eating with him and his disciples, for there were many who followed him. When the teachers of the law who were Pharisees saw him eating with the "sinners" and tax collectors, they asked his disciples: "Why does he eat with tax collectors and 'sinners'?" On hearing this, Jesus said to them, "It is not the healthy who need a doctor, but the sick. I have not come to call the righteous, but sinners." Now John's disciples and the Pharisees were fasting. Some people came and asked Jesus, "How is it that John's disciples and the disciples of the Pharisees are fasting, but yours are not?" Jesus answered, "How can the guests of the bridegroom fast while he is with them? They cannot, so long as they have him with them. But the time will come when the bridegroom will be taken from them, and on that day they will fast. "No one sews a patch of unshrunk cloth on an old garment. If he does, the new piece will pull away from the old, making the tear worse. And no one pours new wine into old wineskins. If he does, the wine will burst the skins, and both the wine and the wineskins will be ruined. No, he pours new wine into new wineskins." There was once a man who, when out walking and coming to a wide stream would throw his coat over to the other side. He said that it was the only way to force him to find a way to cross it! Such extreme determination to take up a challenge, to commit to a decision is rare. In today’s reading from Gospel we see Levi (Matthew) choosing to follow Jesus in a matter of moments. I expect his family and friends would think he had made a reckless decision. In choosing to answer Jesus’ call, Matthew abandoned a prosperous way of life for the dangers and uncertainties of discipleship. In the second part of the reading, Jesus publicly consorted with the tax collector and his sleazy friends. The more cautious of Jesus’ companions must have been worried by the Lord sitting down to eat with hated outcasts. Jesus was being reckless with his reputation, refusing to conform to the respectable behaviour expected from a preacher with a rising reputation. Jesus’ behaviour is a reminder that throughout his life he always chose the brave path, rather than the cautious one, a reminder that he always did what was right rather than what was conventional. Christian life is more often a series of choices, rather than one definitive choice. It is a continual effort to stick to Jesus’ teachings, to try and obey God’s will for us. This coming week sees the start of Lent, when we are called to focus upon Jesus’ path to the Cross at Easter. It is a traditional time for Christians to fast or sacrifice a pleasure to enable them to focus better on their spiritual selves. Perhaps this Lent you might feel called upon to take up something rather than give up! Perhaps you could commit to more regular prayer, to the reading of portions of the Gospel, to a course of study? Lent can be a spiritual adventure for followers of Jesus, but it is a journey which requires commitment and determination. Prayers for Sunday and the week ahead.